House price growth saw a modest slowdown in 2017, with London the weakest performing region, the Nationwide building society has said. According to its latest House Price Index, average prices have grown by 2.6% over the past 12 months, down from the 4.5% recorded in 2016 and 2015. In London, average house prices actually fell, although by a modest 0.5%, the lender said. London was the worst performing area for the first time since 2004. "Low mortgage rates and healthy employment growth continued to support demand in 2017, while supply constraints provided support for house prices," said Nationwide chief economist Robert Gardner. "However, this was offset by mounting pressure on household incomes, which exerted an increasing drag on consumer confidence as the year progressed." Looking ahead to 2018, the Nationwide said it expected house prices for the year to rise by about 1%. "Housing market activity is expected to slow only modestly, since unemployment and mortgage interest rates are expected to remain low by historic standards," said Mr Gardner. "Similarly, the subdued pace of building activity evident in recent years and the shortage of properties on the market are likely to provide ongoing support for house prices." 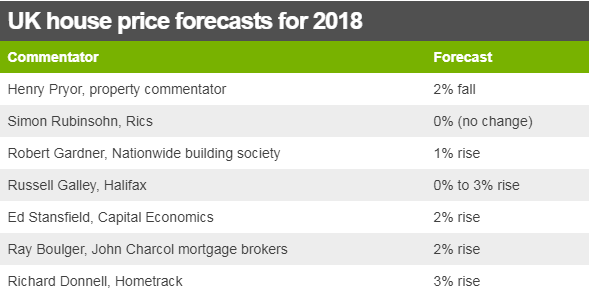 Housing analysts and commentators are expecting a similar picture for house prices in 2018. If anything, they are predicting slower property price growth owing to the squeeze on people's incomes. That would be welcomed by potential first-time buyers, but not by investors. Many suggest that the picture will be very different depending on the area of the country. 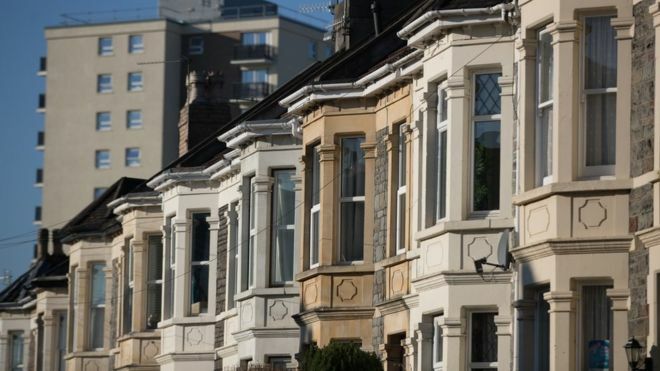 The Royal Institution of Chartered Surveyors says prices might well fall in London and the South East of England, while rising fastest in Northern Ireland, Scotland, Wales and the North West of England. Property portal Rightmove, which tracks asking prices, expects homes with two bedrooms or fewer to rise in price by 3%, compared with a 2% rise in three and four-bedroom homes. The Nationwide said regional house price growth rates had converged over the past year. The fastest-growing region was the West Midlands, where average prices rose 5.2% year-on-year. However, significant disparities remain in price levels and affordability. 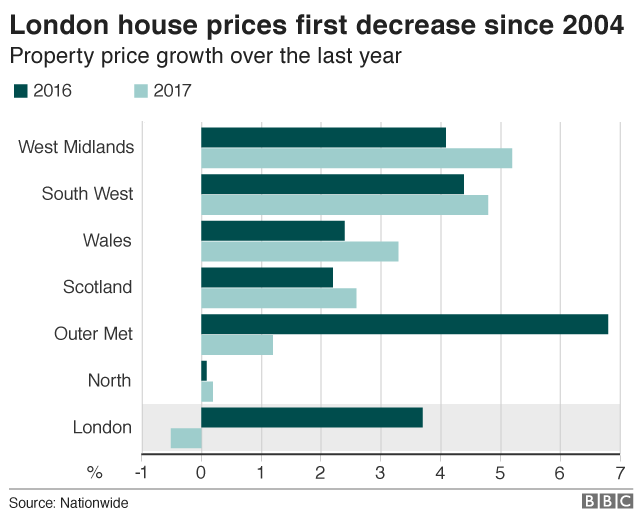 The Nationwide said house prices in London were still about 55% higher than they had been in 2007, whereas in the North of England as well as the Yorkshire and Humberside regions, prices were lower than their 2007 peaks. Samuel Tombs, chief economist at Pantheon Macroeconomics, said mortgage rates could increase from the end of February. A lack of consumer confidence could affect demand from potential movers during the year, he added.